Bill Paynter was anxious to get a head start on his third pro season. 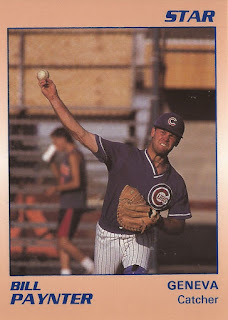 So, in late-February 1990, he and two other Cubs minor leaguers borrowed a pitching machine at Arizona State and set about working on their hitting, according to The Chicago Tribune. The extra work, though, didn't seem to help, at least not enough to extend his career. That third pro season for Paynter was also his last. Paynter's brief pro career began in 1988, taken by the Cubs in the 11th round out of Coronado High School in Scotsdale, Ariz.
At Coronado, Paynter also played football, playing quarterback in 1986 and completing 10 of 15 passes in one contest. With the Cubs, Paynter started at rookie Wytheville. There, the catcher hit .190 in 50 games. He also hit three home runs and knocked in 13. For 1989, Paynter split time back at Wytheville and at single-A Peoria. Between them, he got into 61 games and hit .197. At Peoria, though, he picked up just six hits in 60 at bats, for a .100 average. That head start in 1990 ended up returning Paynter to Peoria for 19 games. But he only managed to hit .115. He played another 29 games at short-season Geneva, but it was his final season as a pro, his career ending without making it higher than single-A.